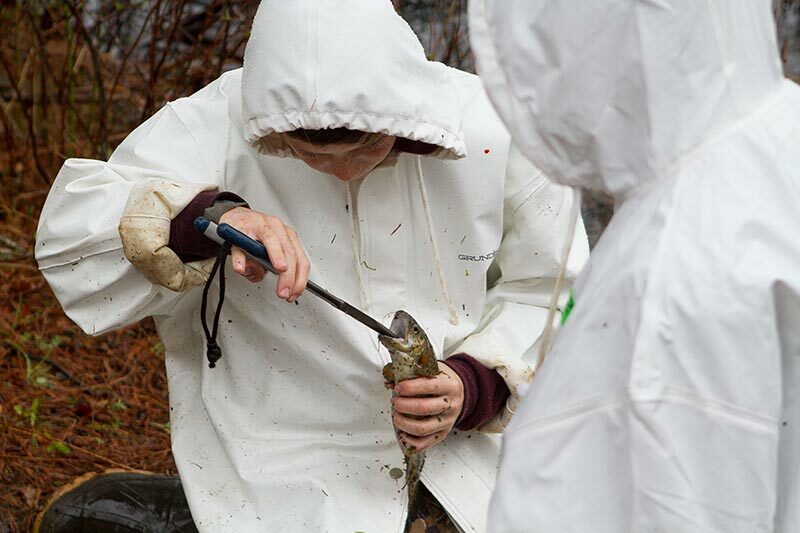 Annual fishing competition endures a wet day, but is well worth the discomfort. 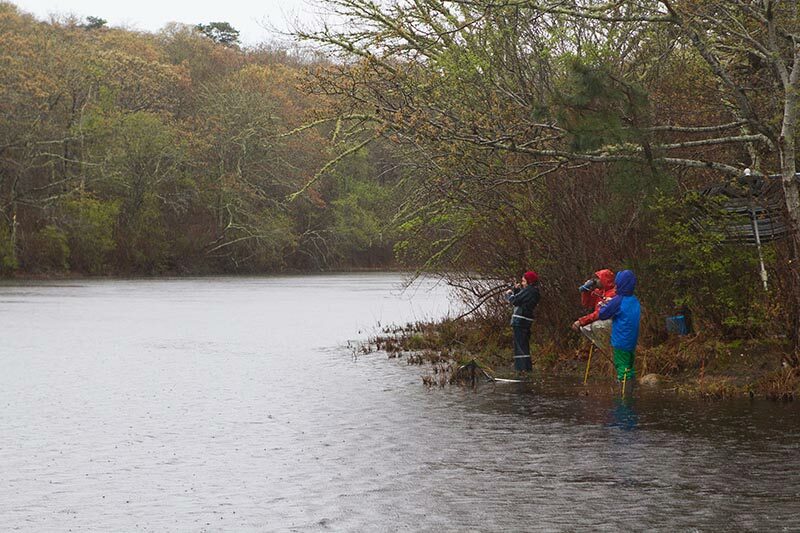 A rainy morning greeted participants of the 43rd annual Martha’s Vineyard Rod and Gun Club Kids Trout Derby on Saturday, held at Duarte’s Pond in West Tisbury. The free competition started at first light and wrapped up early this year, just before 8 am, due to the downpour. The pond was stocked earlier in the week with plenty of rainbow trout, catfish, sunfish, and tiger trout for a long morning of fishing. Similarly, the Derby headquarters tent was stocked with coffee, doughnuts, hot chocolate, and hot dogs to fuel the horde of young fishermen and their parents, and stave off the morning’s damp chill. After a few hours of casting, the crowd gathered to hear the results and collect prizes. 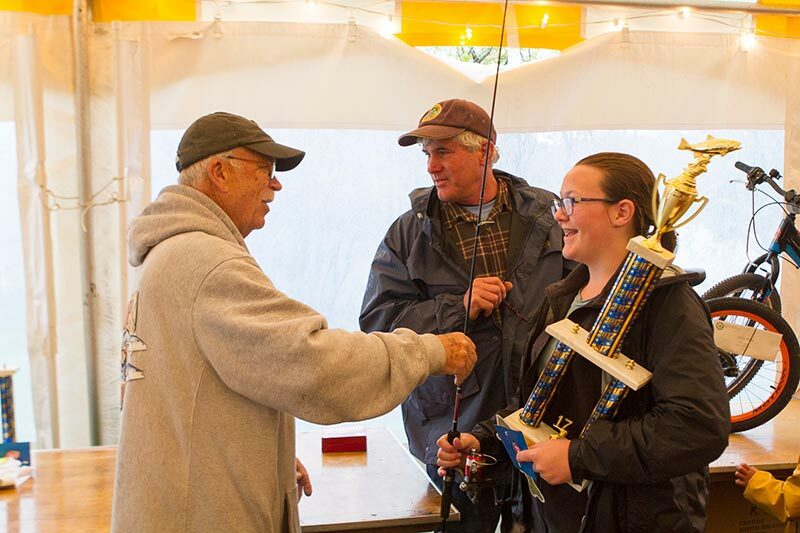 Cooper “Coop” Gilkes handed out Dairy Queen gift cards, and congratulated the competitors on another year well-fished. 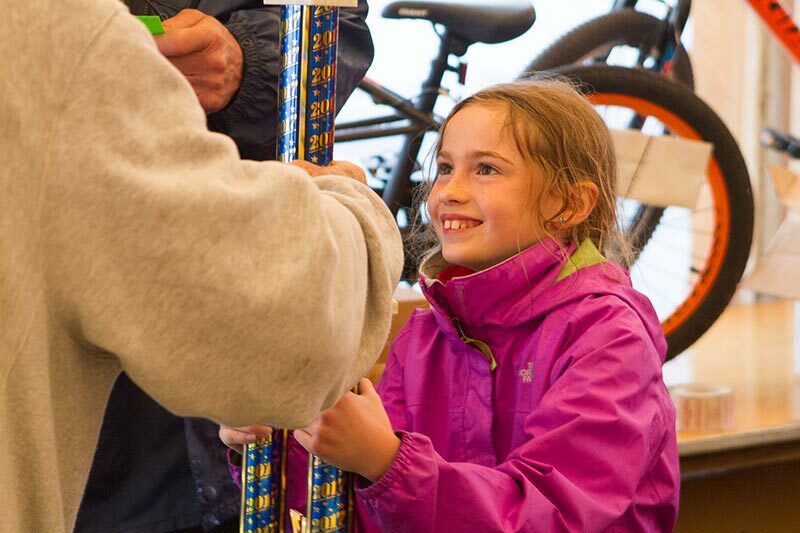 Grace Cotton, age 9, walked out of the tent burdened by more prizes than she could comfortably carry, for catching a 16-inch trout. This was Grace’s third time fishing in the Derby. 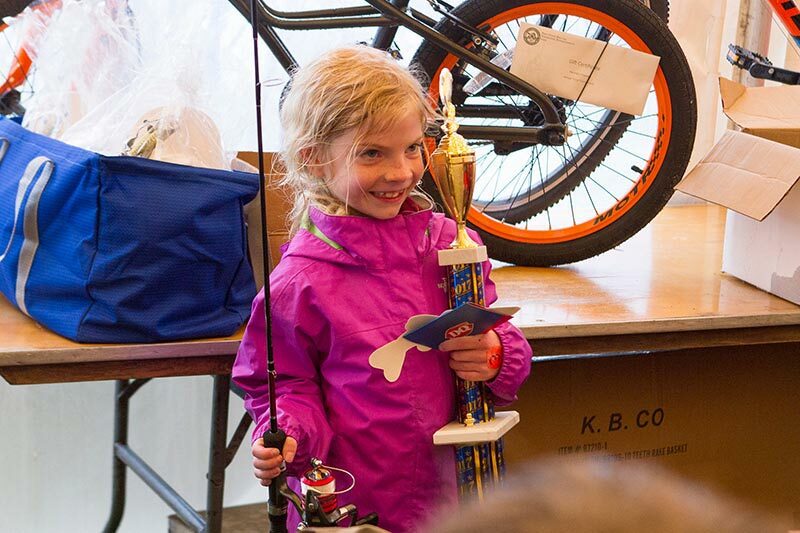 Her sister Caroline Cotton, age 7, fishing in her first Derby, was awarded third place in the 8-and-under category for catching a 14½-inch tiger trout. Dedicated young fisherman Micah Vought was still out fishing when Coop called his name for largest fish of another species. 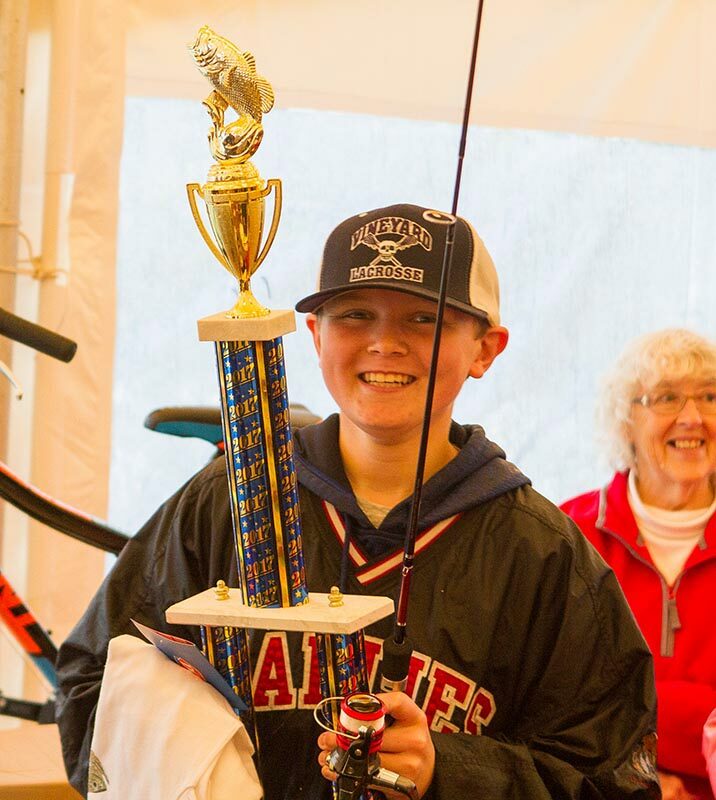 He was given a trophy for catching a 14-inch pickerel. Three new awards were added to this year’s haul of trophies; first, second, and third place for the biggest trout caught. 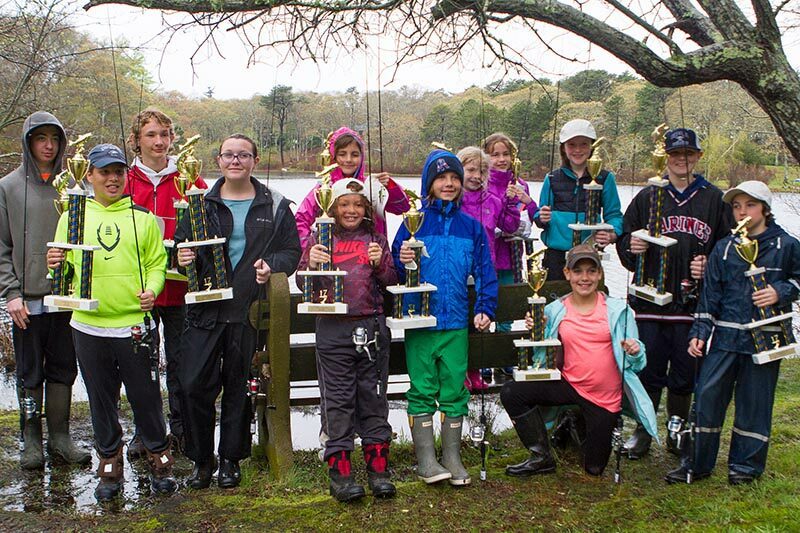 In first place was Grace Cotton, age 9, for her 16-incher; second place, Aubrey Warburton, age 8, for a 15½-inch rainbow trout; and in third, Molly Sylvia, age 10, with a 15¼-inch rainbow trout. The Derby’s largest catch, Charlie the 8-pound trout, was not caught Saturday morning. He will live to see another day, and is still swimming in the water of Duarte’s Pond. 8 and under: 1. Caroline Cotton, age 7, 14½-inch tiger trout; 2. Dreyden Thomas, age 8, 12-inch brown trout; 3. 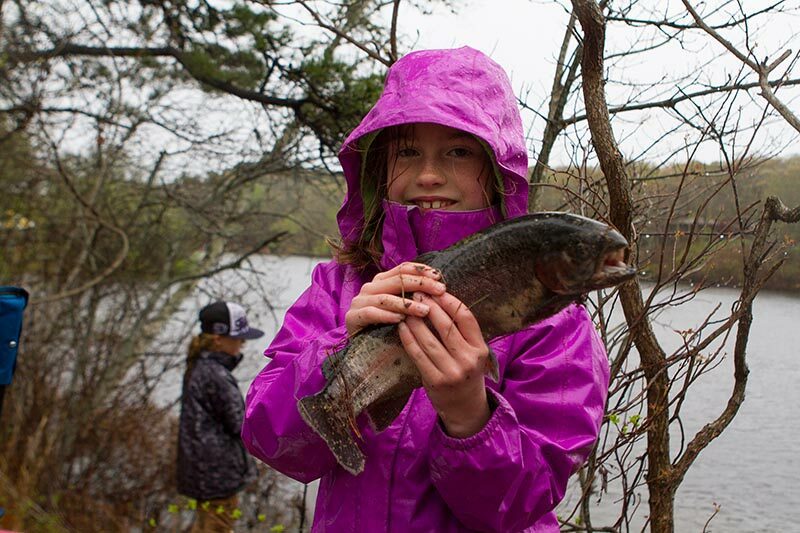 Hailey Smith, age 8, 12½-inch rainbow trout. 9 to 11: 1. Christian Turner, age 11, 14⅞-inch rainbow trout; second, Mason Warburton, age 9, 14½-inch rainbow trout; third, Wesley Wlodyka, age 9, 14½-inch rainbow trout. 12 to 14: 1. Charlotte Packer, age 14, 15-inch rainbow trout; 2. 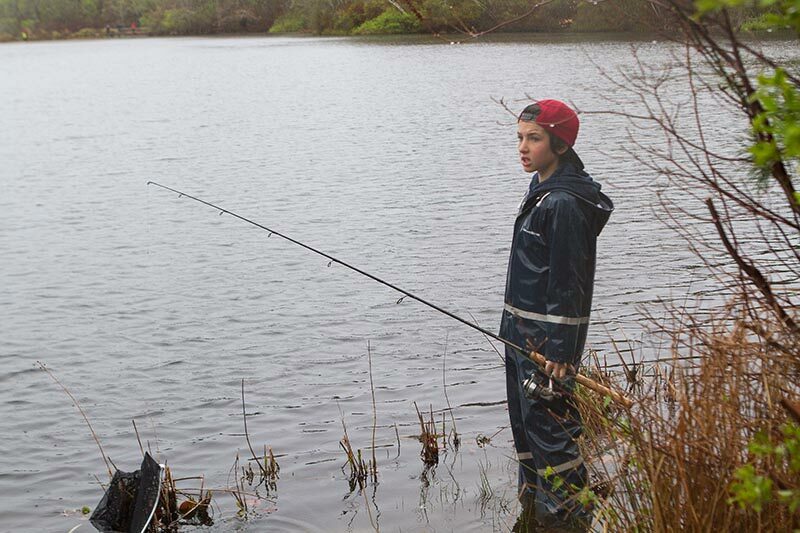 Jake Scott, age 13, 14½-inch rainbow trout; 3. Corvin Buckwold, age 13, 14½-inch rainbow trout. Largest Trout: 1. Grace Cotton, age 9, 16-inch rainbow trout; 2. Aubrey Warburton, age 8, 15½-inch rainbow trout; 3. Molly Sylvia, 10, 15¼-inch rainbow trout. Biggest fish of a different species: Micah Vought, age 14, 14-inch pickerel.